Dr.'s DeFatta will be giving free screenings all day, by appointment, on Thursday, April 12th, at the Altoona office location. Free screening will be provided by Ear, Nose and Throat Associates of Billings, Montana. Contact our office at 406-238-6161 to reserve your spot today. We will be performing free oral cancer screenings in our office on Thursday, April 12, 2018. 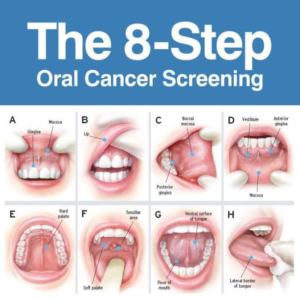 This event is the annual Head and Neck Cancer Screening Event at the Mount Sinai Hospital as part of the Mount Sinai Health System activities surrounding Oral, Head and Neck Cancer Awareness Week. This is a free screening event open to the public. A brief history and head and neck exam will be performed, as. 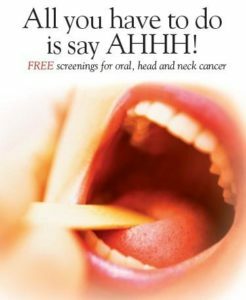 Dr. Selig, medical staff member at Lawrence General Hospital will host a free oral, head and neck cancer screening on 4/12/18 from 1-3pm in the Lawrence General Hospital Ambulatory Care Center. Space is limited. Registration encouraged 978-946-8114. Free Oral Head and Neck Cancer screenings at our Baptist MD Anderson Cancer Center south location. Ten minutes could save your life. Approximately 75 percent of head and neck cancers begin in the oral cavity, which led to tobacco and alcohol users being most at risk in the past. 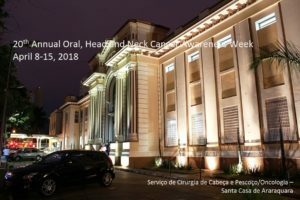 But, today, that isn’t the case..
A free head and neck cancer screening will be provided by an Otolaryngology-Head and Neck Surgeon on April 12th, 2018 in conjunction with the 20th Head and Neck Cancer Awareness Week. The screening will take place at the Mary Washington Hospital Regional Cancer Care Center in Fredericksburg, Virginia. The event will last for 2 hours.